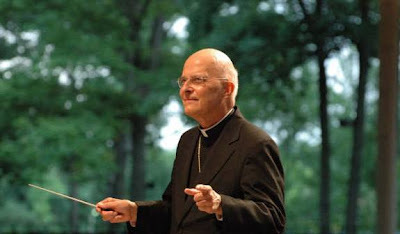 Cardinal Francis George OMI of Chicago has won the presidency of the US bishops with 188 votes, 85% of the total body. The first cardinal elected to the post since 1971, George, 70, is the first religious ever chosen to lead the American hierarchy. By a margin of 22 votes (55-45%), Bishop Gerald Kicanas of Tucson bested Archbishop Timothy Dolan of Milwaukee to win the conference's vice-presidency. A native Chicagoan -- where he served as auxiliary bishop and rector of Mundelein seminary under Cardinals Joseph Bernardin and George -- the incoming VP, 66, has garnered acclaim for his successful handling of the abuse crisis in the Arizona diocese, which had declared bankruptcy in light of settlement costs. Named to Louisville earlier this year, Archbishop Joseph Kurtz was elected conference treasurer by a 2-to-1 edge over Bishop Michael Bransfield of Wheeling-Charleston. Protection of Children and Young People -- Bishop Blase Cupich of Rapid City. Several of the USCCB committees are folding or merging at the close of this November meeting. Of particular note, Bishop Donald Trautman of Erie is closing out his term at the helm of the Bishops' Committee for the Liturgy; as of Thursday, the body transforms into the committee for Divine Worship, with its (yet to be announced) new membership said to be an "all-star" lineup. Trautman will be succeeded by Bishop Arthur Serratelli of Paterson, who's spent the past year transitioning in as chair-elect. A Scripturalist by training, Serratelli is also the US bishops' representative to ICEL, the body overseeing English-language liturgical translations.